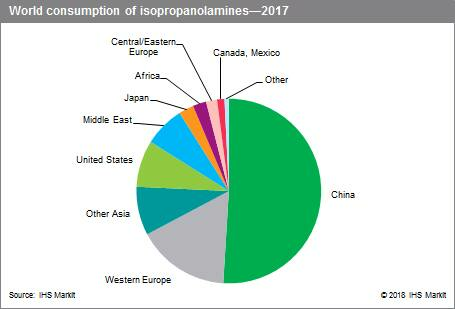 World consumption of isopropanolamines is forecast to grow at an average annual rate of 4.4% during 2017–22, driven by consumption in China, the Middle East, and Other Asia (excluding Japan). In Asia (excluding Japan) and the Middle East, combined consumption is forecast to grow at an average annual rate of 5.6%, driven by the increasing use of triisopropanolamine (TIPA) for cement applications. These countries/regions, especially China, continue to invest in a great deal of infrastructure—a large consuming application for cement. Consumption of isopropanolamines in North America, Western Europe, and Japan is fairly mature and will grow at an average annual rate of approximately 1.7% and 1.5%, and decline at a rate of 0.9%, respectively, through 2022. In Central and South America, Central and Eastern Europe, and Africa, consumption is projected to grow at a total average annual rate of 4.2%. Isopropanolamines include monoisopropanolamine (MIPA), diisopropanolamine (DIPA), and triisopropanolamine (TIPA). They are offered either as single products or as blends. Isopropanolamines are used in a wide array of applications, including gas purification, surfactants (primarily for home and personal care products), cosmetic formulations, corrosion inhibitors, metalworking fluids, cement and concrete processing aids, and as emulsifiers, dispersants, and wetting agents. The major isopropanolamine producing regions (China, the United States, and Western Europe) accounted for approximately 75% of total consumption in 2017. China is the major producer and exporter of isopropanolamines and will continue to be so through 2022. Production in China increased significantly during 2014–17. Exports also increased significantly during that period, especially to Western Europe, the Middle East, and Other Asian countries. Although TIPA for cement applications is driving the isopropanolamine market, particularly in Asia, TIPA is in competition with other chemicals, such as diethanol isopropanolamine (DEIPA), which is also growing in the Asian market. In gas purification, methyldiethanolamine-based (MDEA-based) solvents (both as MDEA/piperazine blends and straight MDEA) have been capturing most of the growth in this application as have ethanolamines at the expense of DIPA. Monoethanolamine-triazines (and other triazines) are also used as hydrogen sulfide scavenging agents. In some surfactant applications, coco-MIPA (cocamide MIPA, coconut isopropanolamide) is displacing cocamide DEA (coconut DEA).